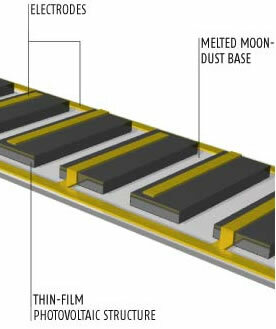 Simulated moon dust has been used to make the substrate of a solar cell, according to University of Houston researchers. The fine grey powder is 50% silicon dioxide, along with a mixture of oxides of twelve different metals (including aluminum, magnesium and iron). Alex Freundlich and his colleagues melted JSC-1, a powder that simulates the lunar regolith samples brought back by Apollo astronauts, in a vacuum. The melted powder solidifies into a smooth, glassy sheet on which solar cells may be deposited by thermal evaporation. The finished cell can then convert sunlight into electricity. The simulated lunar solar panels are only about one percent efficient in converting sunlight to electricity (conventional cells convert about twenty percent). 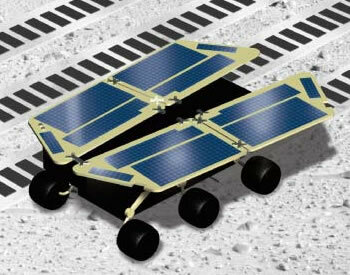 Read more at Lunar colony to run on moon dust and robots. Thanks to Winchell Chung for the idea for this story.